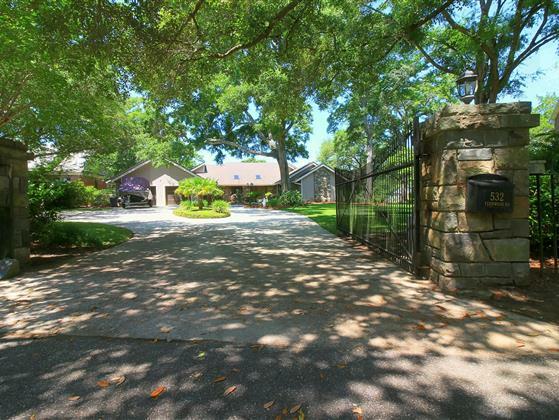 THIS IS A LARGE AND SPECTACULAR CHANNEL FRONT HOME IN THE PRESTIGIOUS AND PRIVATE NEIGHBORHOOD OF MT. GILEAD. THIS LOVELY HOME IS LOCATED ON A DOUBLE LOT WITH OVER TWO-THIRDS ACRE AND FEATURES INCLUDE A SWIMMING POOL WITH LARGE, MULTI-LEVEL DECKS, STATIONARY AND FLOATING DOCKS, IRRIGATION SYSTEM AND A FENCED YARD WITH AN ELECTRIC GATE. 236 FEET OF CHANNEL FRONT WITH A NEWER SEA WALL AND BRAZILIAN IPE WOOD DECKING. THIS HOME HAS BEEN TOTALLY RENOVATED AND BASICALLY REMADE! PLEASE ASK FOR A LIST OF ALL OF THE RENOVATIONS AND UPGRADES! A FEW ARE: SOLID HICKORY DOORS, AMD FLOORING; PINE CEILINGS; ENERGY EFFICIENT SPRAY FOAM INSULATION; CLIMATE CONTROLLED CRAWL SPACE; CENTRAL VACUUM SYSTEM; UPGRADED, HIGH END GOURMET KITCHEN APPLIANCES; NEW GARAGE DOORS AND OPENERS; CAR LIFT; 100% UV PROTECTED WINDOW TINT AND SECURITY FILM ON ALL DOORS NEW WATER HEATS, ETC.